I‘ve been thinking about the recent press release by the Sons of Confederate Veterans on the eve of the 150th anniversary of John Brown’s Raid at Harpers Ferry. If you remember, they have chosen to commemorate the death of Heyward Shepherd, who happened to be black and working at the local train station at the time of the raid. There are a number of things that are disturbing here. Referencing Shepherd as an “unfortunate black citizen” reflects the most basic misunderstanding of black civil rights history since the Supreme Court ruled in the Dred Scott case of 1857 that blacks could not be citizens. Unfortunately, that is about par for the course when it comes to getting the basic facts right in the SCV. What is more disturbing, however, is the blatant way in which the SCV distorts black history to serve their own agenda. Notice that at no point in their announcement did they even mention why John Brown was in Harpers Ferry. They do mention his “nefarious scheme”, but it would be helpful if the public was told what that scheme involved: How about nothing less than the freeing of the slaves. Now please don’t misunderstand me as I am not suggesting that we should not engage in serious debate about the ethics of Brown’s life and actions in Kansas and Virginia. The problem here is that the SCV has set up the parameters of debate in a way that serves their own purposes of distancing slavery from Confederate and Southern History. More to the point, why honor Heyward Shepherd at all? It is unfortunate that he was caught in the cross-fire, but does that in and of itself constitute a sufficient reason to honor him or give him his own day? Would the SCV have taken these steps if Shepherd happened to be a white baggage handler? The bigger problem is the choice of which black man to honor. If you were just to rely on the SCV’s press release you might think that the only black individual in Harpers Ferry was Shepherd. And here is where the intentional distortion of the past occurs. There were five black with Brown at Harpers Ferry: three free blacks, one freed slave, and a fugitive slave. How do these men fit into the SCV’s understanding of this event? Why aren’t they being honored as opposed to Shepherd. I think I have an idea. Notice in the press release that Shepherd is characterized as a “faithful employee.” What possible reason could the SCV have in characterizing an employee as faithful? Of course, anyone familiar with the historiography of Southern history knows that that one word, ‘faithful’, resonates throughout the Lost Cause literature, which characterizes slavery as populated by faithful and obedient slaves. This morning I came across an excellent video on the black legacy of John Brown and Harpers Ferry. The documentary did not focus on Brown, but on the five blacks who accompanied him: Dangerfield Newby, Lewis Sheridan Leary, Shields Green, John Anthony Copeland, Jr., Osborn Perry Anderson. Although I skipped around a bit I am pretty sure that you will not find Shepherd’s name mentioned (perhaps a brief reference) in this 48 minute video. The importance of the Harpers Ferry Raid in the local black community is to be found in the actions of the five men mentioned above. The distance between the SCV’s preferred memory of Brown and Harpers Ferry and the history of black Americans in the area couldn’t be wider. 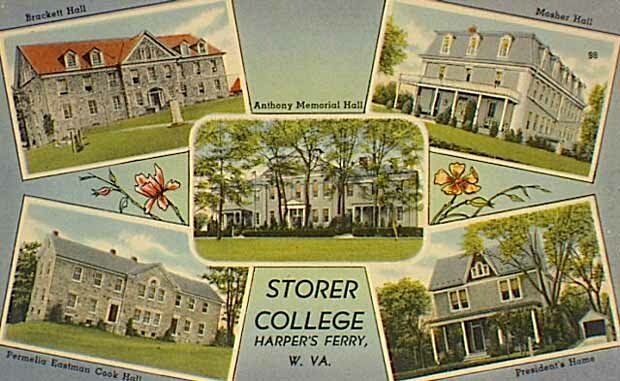 As you will see in the video, for example, Heyward Shepherd’s death, however tragic and unfortunate, does not explain the rise of Storer College and its rich history of education and black civic activism. Exactly what is the SCV commemorating? I've recently discovered your site and enjoy it. John Brown has been an abiding interest of mine for some time. His memory seems to shift according to the views of the generation reconsidering him. The mixture of fear, abhorrence and respect accorded him is fascinating — Villard's biography is especially interesting for the ambivalence it contains. Modern scholarly research seems to indicate that Brown was probably NOT insane and, in fact, calculated pretty accurately what the effect of his raid would be. One of the most provocative — if not among the best-known — books about him is John Brown's Journey by Alfred Fried (Anchor Press, 1978). It was written by a former campus radical and makes a cogent case for Brown's rationality and political savvy. Come on Kevin the NAACP is just as bad as well as many other groups including some academic historians when it comes to not removing the rose colored glasses or their personal biases. I certainly agree that the NAACP has exploited the past for its own purposes. I've been critical of their actions on this blog, but I fail to see what that has to do with the content of this particular post. Whether I make a reasonable point here is independent of whether or not I comment on other organizations. Your correct the VA SCV is gulity as charged.